Senator Miriam Santiago correctly introduced a legislative formula through a bill she drafted and called it An Act to Prevent Luxurious Conditions in Prisons. Accordingly, “prison officials shall provide living conditions and opportunities to prisoners within its prison that are not luxurious than those conditions and opportunities the average prisoner would have experienced…”And rightly so, government could not even build additional facilities for its jammed facilities save for superfluous amenities for its numerous inmates who are virtually lumped and literally are heaped one on top of the other. While it has been said and practically enshrined in the Constitution that it is the policy of the State to prevent the imposition of excessive, cruel, degrading and inhuman punishment, the condition in almost all corrective facilities in the country defy hitherto such constitutional policy. To introduce by administration luxurious condition would not only amount to a crime but igniting violence among those who would not be able to obtain it. It has been noted through a scientific study that encamping 10 persons in a small room would increase the temperature by a degree higher than the prevailing condition. 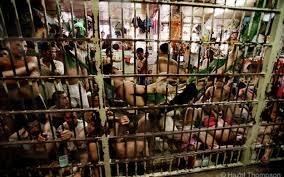 In prison, it is not only 10 or 50 or 100 but thousands are lumped inside a dormitory contributing to gross overcrowding. They are literally living inside a live microwave oven! Without capital outlay, prison administration is left at the mercy of luck to avoid possible conflagration or genocide. Furthermore, deaths in prison as a result of lung defects is a daily occurrence and may only be regarded by the prison population as part of their travails and consequence of their penalty. Congestion is a cruel manifestation of unabated influx of convicts in a small area intended for their welfare and rehabilitation while serving their time. Living condition in all prison and detention facilities are indeed callous and disregard any standard application of rules. Government could not contain much more so sustain a situation where standards in accommodation and proper handling of prisoners are criterions to be met. Funds are just too limited to appropriate to build more facilities. Donors and contributors from non-government agencies led by Church and the Academe which are basically advocating humane principles are always at the forefront of providing the necessary wherewithal the prison community needs. Without this representative sector, the prison community would have been doomed years ago. Prisons are never designed to conduct a slow dehumanizing process to exterminate inmates. It is not even contemplated in the basic law of the land. The Bureau of Corrections was never even organized to pursue inhuman practices. The agency is there to promote the safekeeping and rehabilitation of all inmates. But the congested situation poses a challenge which not even volunteer sectors could address. Not even the introduction of new laws unless it is meant to build and expand facilities or reduce penalties and regularly grant clemency more than the courts would issue commitment orders. The so called No Frills Prison Act is an ideal imposition in a standard prison situation; where inmates are properly assigned in regular cells at normal accommodation rate; where population count does not exceed markedly the level it is designed to house inmates. It is an ideal response to a normal prison condition where anything introduced over and above the requirements would tilt the balance and create abnormalities. But the prison system is nowhere near the standards, nowhere near normal level, nowhere near the criteria for humane subsistence. If a patient is placed in the Intensive Care Unit of a hospital, it is not out of whim that he is brought or simply just to make it appear that he needs extra frills. He is there to make him live longer. If a patient is given a number of expensive medical procedures, it is not even luxurious, although the cost of medicine may considerably point towards that direction, but a way to heal the patient. Similarly, if an industrial fan or an air-conditioning unit has been allowed to be used in the prison community, it is merely to arrest the gradual increase of deaths through punctured lungs by most inmates. Donated resources to build more facilities as living areas for inmates are better than seeing prisoners scattered and sleeping on the ground and pathways. Television sets and musical instruments, even an influx of visitors and donors reduces the tension of a congested facility, extending further hope and a peaceful condition in the prison community. The prison climate is lightened and unburdened. Without these items and considerations, peace is nowhere and violence the order of the day. This should not be a regular input in a corrective facility though. It should be tempered and regulated. At most, it should be prohibited even. But government should address the principal culprit on congestion by expanding its facilities first, building more dormitories if not actively grant clemency and releases. In US Federal States, if the court knows that the facility where a convict would transfer is congested, the sentence is suspended. The judiciary knows that a congested facility would defeat the very purpose of rehabilitating an offender. In other countries, the sentencing procedure is even liberal to the extent that there are more releases than admission creating a balanced prison population level without overcrowding. In other countries, an inmate occupies a cell, at most two of them. In a congested facility, a cell good for 20 is packed up to 75. An inmate who leaves his sleeping space and desires to pee once through would not have a space to go back to. There are those facilities where prisoners are like spiders splayed all around the available vertical space available in the dormitory. Ironically, prison administration still is confident that those who passed through the rigors once released are rehabilitated and are presumed to be law abiding citizens thereafter. No Frills Prison furthermore is great and more relevant if prison facilities have met the standards. In the same way, there is no need for an ICU if what is needed is aspirin. Posted on March 2, 2014, in Uncategorized and tagged prison, prison community, prison population. Bookmark the permalink. Leave a comment.